My mates at Baisikeli borrowed a custom-made bike used in film shoots for possible usage in a Canadian tv-crew that Copenhagenize.com/Copenhagen Cycle Chic are hosting this week. 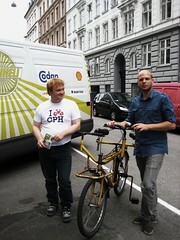 They're doing a documentary on sustainability that includes Copenhagen. I'm trying to get them to film by bike so we'll see what they say to this Buddy Bike. 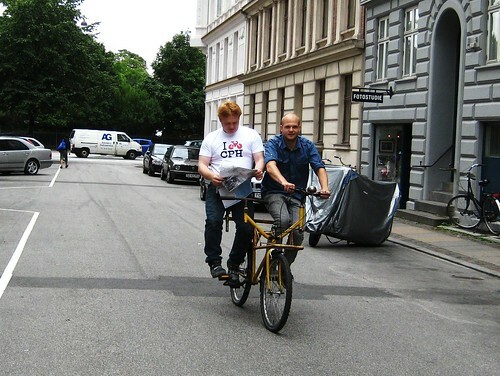 It's a custom-made bike for use in the Danish film and tv industry. One steers the bike and the and the cameraman shoots from the buddy seat, while helping to pedal. He has handlebars, too, but they don't move. They're only for resting on. There is a front rack for gear and the camera can also be placed in the middle of two handlebars for stabilisation or resting. What a cosy ride. This bike is perfect for The Slow Bicycle Movement. We were discussing how it can be used in other ways. Among the ideas were a footbath on the front rack, a bucket of ice filled with beer, etc. 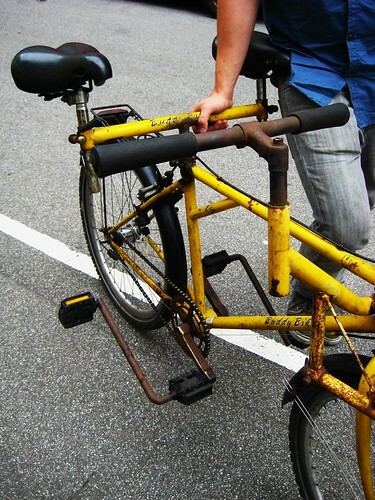 Any other good ideas for The Slow Bicycle concept? How could we use this bike for maximum slowness and cosiness?